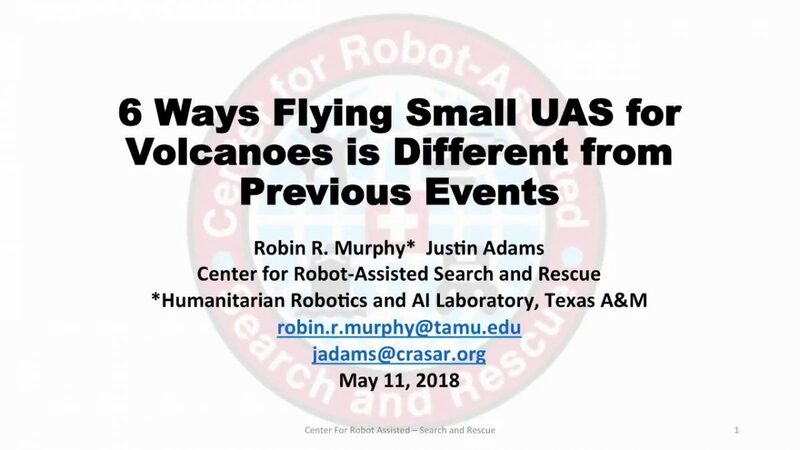 A five person volunteer team from the Center for Robot-Assisted Search and Rescue deployed to the Leilani Estates Eruption event (Hawaii) from May 14-19, 2018 with a cache of small unmanned aerial systems rotorcraft and sensors. CRASAR supplemented existing sUAS capabilities from the University of Hawaii Hilo, allowing them to focus on geographical and volcanology aspects, while providing expertise in tactical operations. During the 16 night flights when manned aviation was prohibited, the CRASAR team identified a new fissure and provided the data used by the USGS to determine the rapid acceleration of the lava flow. Other day missions charted SO2 emissions, mapped fissures, assisted with a live save, supplied tactical situation awareness, and reduced the risks and costs of manned helicopter flights. The sUAS flights were notable for the extent of night flying, flight operations in unfavorable rain and wind conditions, the use of the new X5S thermal sensor, air sampling with rotorcraft, the use of Hangar Enterprise Platform for rapid reconnaissance, flying at 1,000 ft AGL, and live streaming over FirstNet. The CRASAR pilots were Justin Adams (Constellation Consulting Group), David Merrick and Laura Hart (Florida State University Center for Disaster Risk Policy), Jon McBride (Rocky Mountain Unmanned Systems), and Robin Murphy (Texas A&M University). Funding was provided in part through research grants from an insurance partner and the National Science Foundation. At this time, the imagery and video collected at the event has not been released to the public by the Hawaii Civil Defense, and thus we cannot share it. We’ve been watching the Hawaii volcano with interest- it is a first of its kind event for small UAS. Check out the short podcast. And hope the volcano doesn’t blow… best wishes to the responders and the people impacted.